This study examines how gender is portrayed in the hagiographic tradition surrounding St. Brigit of Kildare. In particular, it provides an in-depth look at how Brigit, as presented in her hagiographies, constantly undergoes gender transformations. These gender transformations are analyzed using material gained from a study of the way women were viewed in the early Medieval period, with an emphasis placed on how they were viewed in Ireland during the same period. 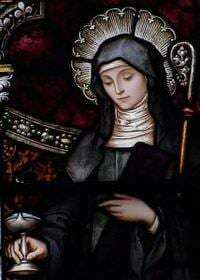 A focus on the theology about women of the time, Irish spirituality and the theology behind it, as well as the conventions of hagiography and in particular the special characteristics of Irish hagiography are also offered. The women of past generations are often overlooked in history. The chronicling of human endeavours was for a long time a “boys’ club”. It was history about men, written by men. If women were written about it was as a footnote, usually highlighting the connection, either as a mother, sister or wife, between the woman and a great man. That is not to say that women were excluded completely; there are examples of extraordinary women being included in history such as Genovefa of Paris, Julian of Norwich, Catherine of Sienna and Simone Weil to name but a few. In Christianity, the number of great holy men outweighs the number of great holy women considerably. For example, in the Dictionary of Irish Saints by Padraig O Riain, of the five hundred and twenty saints, or so, listed as having a feast day, only around twenty of them are women.